Not to long ago, I wrote a post about what a state machine is. That post covered the state machine as a concept and way to organize your thoughts. 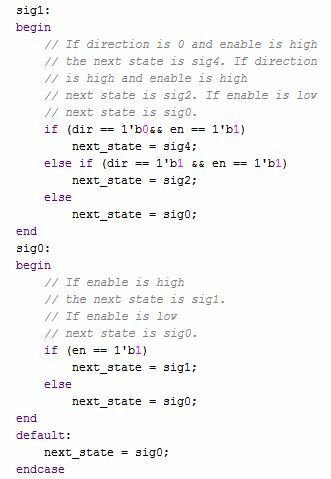 Well, if you are looking to use state machines in FPGA design, the idea isn’t much help without knowing how to code it. As you know from the last post, a state machine is made up of three components. 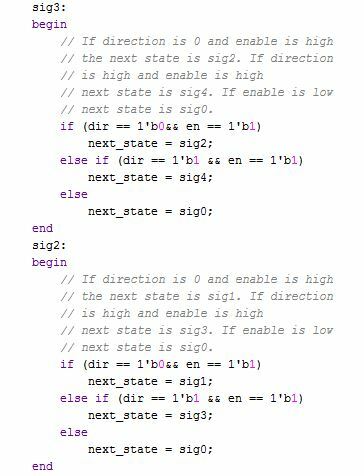 The next state logic, state register and output logic. The first component I’ll go through is the next state logic. This is coded directly from the state diagram. I’m going to put the state diagram here for reference. Stepper motor controller state diagram. This block of code creates the state variables. This way each state can be referenced by name. This block of code creates the state registers that hold the next_state and present_state variables. This is which circle you are on on the state diagram. This is the first chunk of the state logic. It shows, if you are in state sig4, based on the input what the next state is. This encapsulates the arrows on the state diagram. This is the second chunk of the next state logic. It defines where you go next if you are in sig3 or sig2. This is the third chunk of next state logic. It defines what to do if you are in state sig1 or sig0. This is the output logic. This is represented on the state diagram as the purple text. This is the state register. 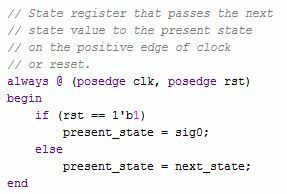 It moves the next_state to the present_state on the positive clock edge. This is what makes movement between the states in the state diagram happen. 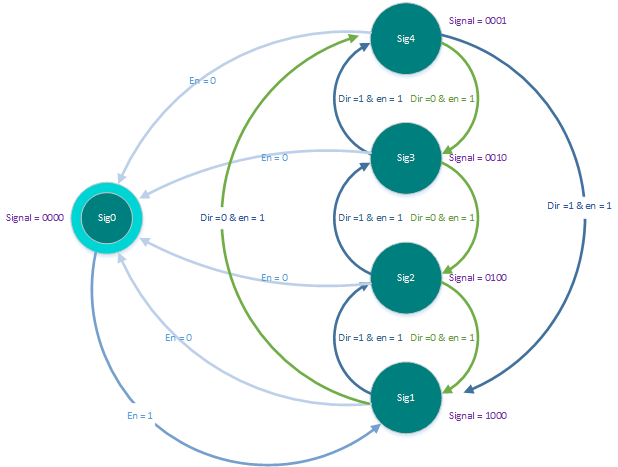 For more information on this state diagram and full code. 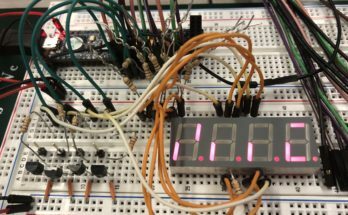 You can view the instructable on driving a stepper motor with FPGA. When are a Digital Multimeter and Analog Scope Not Enough? Is there a VHDL version too? I was wondering if you can provide a blog post about designing a simple digital phase modulator, I’m interested in building my own Software Defined Radio, applying my FPGA knowledge in designing most of the digital components of the radio would be amazing. Unfortunately I don’t know VHDL well enough to confidently write up a similar post, I’m in the process of learning. 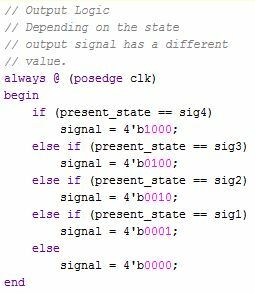 However, I found this blog post that has a VHDL example. If you get stuck at any point in writing your state machine please feel free to post on forum.digilentinc.com. There’s a whole community of people like me willing to help you out! I haven’t done any Digital Phase Modulation myself but it looks like from my brief internet search that it’s similar to PWM. If this is the case I’m working on a instructable and blog post on using servos with FPGA which uses PWM. That should be posted relatively soon. If not, and in the mean time I would post on forum.digilentinc.com. 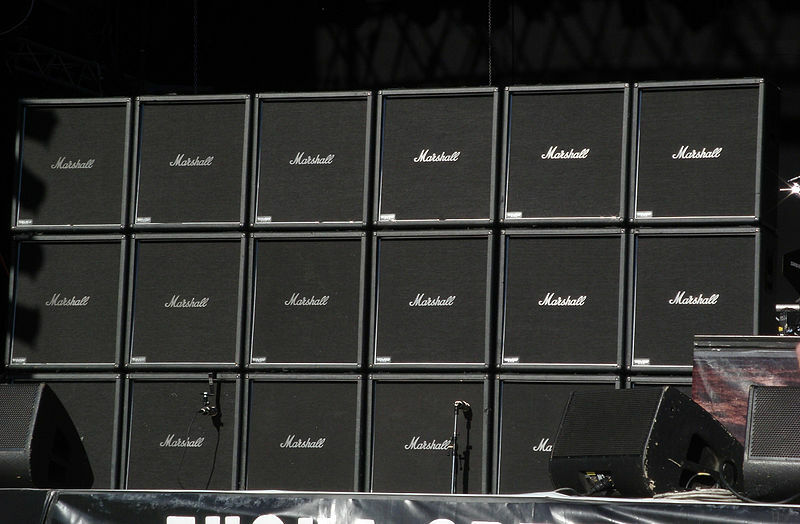 One of the members of the Digilent Forum may have already done this and likely would be better help than me. I explain how the state machine works and introduce it originally in this post. It explains how state machines work and gives a little more detail about stepper motors. 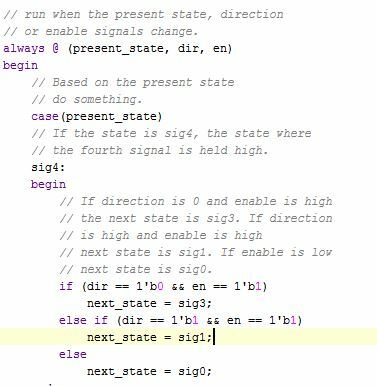 I am in process of learning Verilog and SysVerilog these days, and i used your blog as a test by just referencing the state diagram. Please checkout my code, i am currently in process of writing a test bench for it as well. I’d recommend posting on Forum.digilentinc.com. There is a whole community of excited FPGA enthusiasts that could help you out with your code. You can also refer to the video by Mr P R ShivaKumar which gives a simple and easy explanation of State Machines.